The Philippine-California Advanced Research Institutes (PCARI) Project is extending the submission for the Cycle 6 Request for Proposals to 20 April 2018, 11:59 PM, PHT (20 April 2018, 08:59 AM, PDT). In the interest of inclusiveness in government development initiatives, all proponents for 2018 Cycle 6 R&D projects for PCARI funding are required to involve other Higher Education Institutions (HEIs), public and private, particularly those that are not PCARI project research partners. Involvement begins with the preparation of the collaborative proposals and eventually progresses to the implementation of approved projects. The objective is to broaden the base of HEI participation in the PCARI Project. The forms of engagement should be expressly mentioned in the “Narrative Proposal” and reflected in the pertinent project forms for submission. Proponents are reminded that all project proposals shall be submitted by 31 March 2018. See the announcement of PCARI Cycle 6 RFP here. The PCARI Project is pleased to announce a new cycle of Request for Proposals (RFPs) for CHED PCARI funding in 2018. Proposals must address significant societal problems and have the potential to bring about and sustain technology transfer and/or commercialization activities. For this 6th round, proposals are encouraged in e-Learning, Artificial Intelligence, Data Science, Agriculture, Food Processing, Nutrition, and Marine & Aquatic Sciences related to health innovation & translational medicine, and information infrastructure development. Research project proposals must be jointly developed and implemented by a Philippine-based HEI and a research university in the State of California, USA. At present, only the University of California Berkeley (UCB), the University of California San Francisco (UCSF), University of California Davis (UC Davis), University of California Los Angeles (UCLA), University of California Merced (UCM), and University of California San Diego (UCSD) are eligible to participate. Submissions must be received electronically by the PCARI Secretariat at proposals.pcariproject@ched.gov.ph on or before 31 March 2018, 11:59PM, Manila time; (31 March 2018, 8:59AM, PDT). The specifics of this call may be found in the attached RFP Guidelines and application packet. Got a question about PCARI Project but not quite sure where to ask? We’ll try to answer all of it here! 1. WHAT IS THE PCARI PROJECT? 2. WHAT IS THE LEGAL BASIS OF PCARI? The legal basis for this project can be found in Special Provision No. 6 "Allocation for the Research and Scholarship Project" of Republic Act (R.A.) No. 10352, otherwise known as the General Appropriations Act (GAA) for Fiscal Year (FY) 2013. 3. WHY DO WE NEED THE PCARI PROJECT? This unprecedented government initiative is needed to address societal problems and at the same time enable the country to catch up with its neighbors in developing a sustainable university-based research and development (R &D) infrastructure for technological innovation. 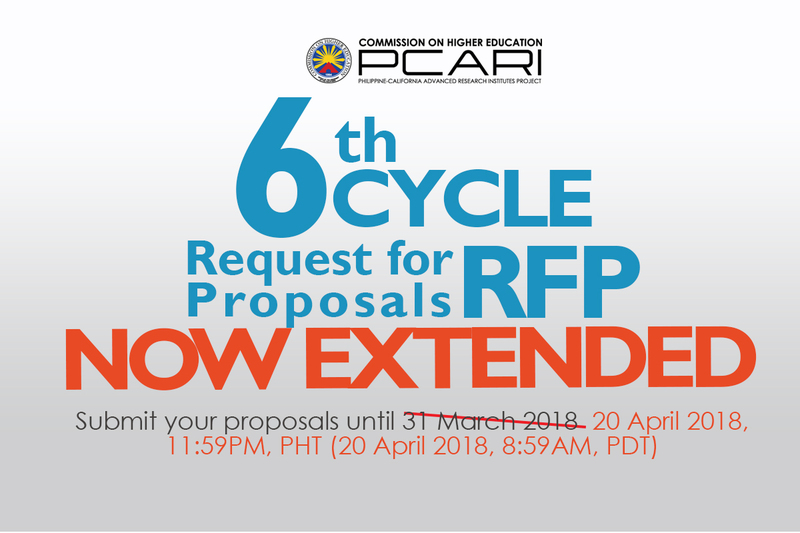 Cycle 5 Request for Proposals now extended! We are extending the submission for the Cycle 5 Request for Proposals to 04 August 2017, 11:59 PM, Manila Time (04 August 2017, 07:59 AM, PDT). The PCARI Project is pleased to announce a new cycle of Request for Proposals (RFPs) for CHED PCARI funding in 2017. Proposals must address significant societal problems and have the potential to bring about and sustain technology transfer or commercialization activities. For this cycle, preference will be given to research project proposals dealing with the applications of information infrastructure development or health innovation and translational medicine in Artificial Intelligence, Data Science, Agriculture, Food Processing, Nutrition, Marine and Aquatic Sciences. Research project proposals must be jointly developed and, if approved, jointly implemented by a Philippine-based HEI and a university located in the State of California, USA. At present only the University of California Berkeley (UCB), the University of California San Francisco (UCSF), University of California Davis (UC Davis), and University of California Los Angeles (UCLA) are eligible to participate. Submissions must be received electronically by the PCARI Secretariat at proposals.pcariproject@ched.gov.ph on or before 31 July 2017, 11:59 PM, Manila time; (31 July 2017, 08:59 AM, PDT). The Commission on Higher Education through its Philippine-California Advanced Research Institutes (PCARI) Project presents the PCARI International Seminar- Workshop on Laying the Foundation for the Future of Research and Development in the Philippines slated on March 23-24 in Metro Manila, Philippines. It has the objective of identifying common issues and challenges in R&D management, and producing a unified set of recommendations to lead the country’s productivity in research and innovation. Over 200 research and development leaders from government, academe, foreign agencies, and non-government organizations across the country are expected to gather at the seminar-workshop including research management and administration experts from PCARI collaborating institution University of California (UC) Berkeley. Plenary and parallel sessions shall tackle common R&D issues and challenges, including research project pre-approval processes, project implementation, intellectual property, and scholarship concerns. This 2-day event will be held The Peninsula Manila, Makati City. For more information, please contact Jovianne Fernandez at (+632) 352 5591 or send an email at info.pcariproject@ched.gov.ph. 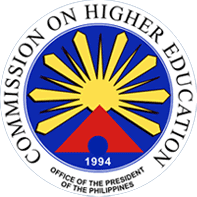 The Philippine-California Advanced Research Institutes (PCARI) Project is a research and development of the Commission on Higher Education approved in the General Appropriations Act of 2013. The Project is a new approach to enhance the skills and expertise of faculty, students, and staff of Philippine universities through scholarships, trainings, and research partnerships with globally highly-ranked research universities in California, USA, in the priority areas of Information Infrastructure Development (IID), and Health Innovation and Translational Medicine (HITM). Workshop: "Into and Out of English: Neurology and Emergency Medicine Abstracts"